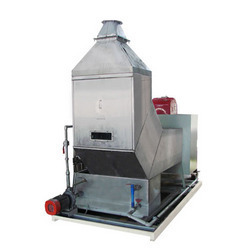 We are a renowned manufacturer and exporter of Hot Air Humidification System. This humidification system is manufactured using the superior quality of metals. We offer an extensive range of humidification systems distinct in capacities and other specifications. Our offered humidification systems are highly appreciated by clients for their robust construction, excellent performance and low power consumption per bale. Hot Air Humidification System offered by us is extensively used for restoring moisture in cotton lint to the acceptable level by means of psychometric principles. Instant humidification by easing out the wax surface of the fiber and recuperation after humidification by cooling effect for retained moisture. Preserves fiber length improves strength and uniformity and reduces short fiber content. Eliminates moisture condensation which is a general problem with all other moisturization techniques. Increases the lint slide capacity and allows more cotton to enter the press box at each stroke of the tramper and hence higher density bale is obtained. Improves the capacity of the bale press whereas dry cotton requires higher compression forces and more time to charge and compact it into the press box. Achieves better sliding of lint in the lint slide. Hot humid air is inducted in the lint on a lint slide with a set of louvers at the temperature around 45 to 50 Degree Celsius. The hot air eases out the surface tension of the fiber and humidity is transferred to the inner stem while air passes out. The cooling down recuperates the fiber surface and maximum moisture contents are retained by fiber for a longer period. This is a unique device manufactured by Bajaj Steel Industries Limited in technical collaboration with M/s. Samuel Jackson Inc. USA. It is a high-temperature Humidifier for generation of Humid hot air free from water droplets. The vapour phase transfer of moisture at the diffuser assures controlled and positive enhancement of moisture content in lint to highest acceptable level, as per international standard. This reduces pressing force of bale press resulting in and increases bale weight. Looking for Humidification Systems ?